idibu provides you with three different methods of reposting adverts. Here's a breakdown of each..
Reposting a role (i.e reposting in full) will take you back through the 3 stage posting process. Using this method allows you to update the content of your job posting - i.e change the salary, adjust the description, or add more boards to your list of destinations etc. Please note, whilst you can obviously change the content of the posting, this is not a blanket edit function. In other words, every board operates differently to the next and will have different policies around updating and editing existing roles. Sending 'edited' postings may or may not cost you a posting credit, but this is full dependent on the board you're posting to. If in doubt, please check with your respective Account Managers at each of your job boards. Also, take a moment to read this article about editing adverts. 'Quick Repost' is an extremely useful tool that allows you to process, in theory, up to 100 adverts at any one time with just a few clicks (depending how many jobs are displayed on your page). Please note that this option does not provide any option to update/amend the role - it simply sends the same 'packet' of data back to the selected job boards. The primary reason for using Quick Repost is to update expiring (or expired) ads, essentially refreshing them on the job boards they were originally posted to. Simply select 'Quick Repost' on the actions menu and tick the boards you wish to quick-repost that role to. Then repeat this process on the next job, select each board as required and so on (queue up as many postings as you like). Once you've made your selection in full, click on 'Quick repost all ads selected' to process everything in one hit. Does exactly what it says on the tin. 'Post from Template' will simply create a brand new role in idibu but taking everything from the one you've just selected. This includes everything from salary, start-date, job description, right through to all of the extra fields on each job board you previously posted to. You'll be taken back to 'stage one' of posting, and will have the option to adjust anything as required. 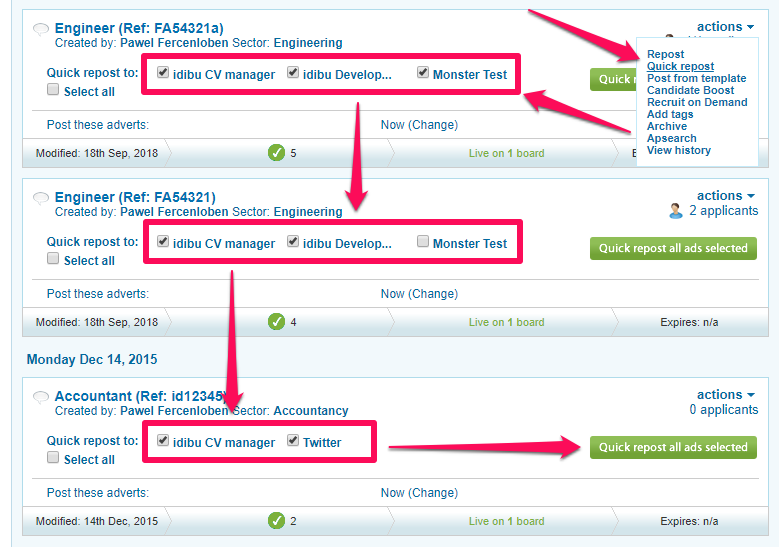 This is a very helpful option when you have multiple roles in different locations (for example), just make sure you change the job reference for each 'new' role to avoid any complications.